Is Ultherapy Treatment for me? Ultherapy offers significant and satisfying non-surgical results, making it appealing to a wide range of adults looking to exert some amount of control over their skin as it ages – particularly those who may not be ready for an invasive brow lift or face lift. Whether you are between surgeries, using a non-invasive treatment regimen or looking for an entry-level way to put collagen in the bank as “skinsurance,” an Ultherapy treament is a great option. 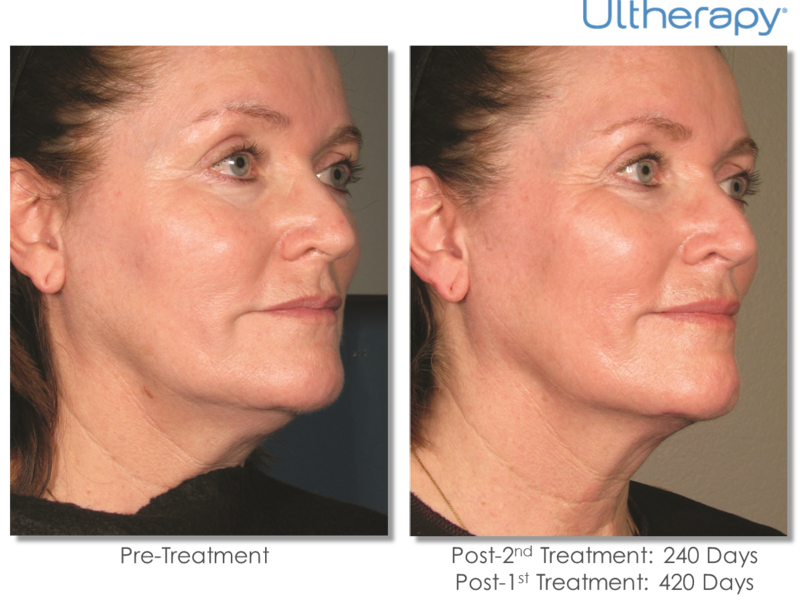 Ultherapy is an uplift, not a facelift. It’s a natural, non-invasive, new type of non-surgical procedure that uses ultrasound and the body’s own natural healing process to lift, tone, and tighten loose skin on the brow, neck, and under the chin. An Ultherapy procedure typically takes around 60 minutes, but will depend on the area to be treated and the treatment plan determined by your practitioner. There are no special after-care requirements and you can resume your normal activities immediately. Patients treated with Ultherapy still have fresh young collagen after a year’s time following the procedure, but skin continues to age. Future touch-up treatments can help keep pace with the aging process, which varies by individual. The majority of patients only need one treatment; however, some may benefit from more than one treatment (depending on how much laxity they have and their body’s own biological response to the ultrasound and collagen-building process). Dr. Horn will be able to recommend the right treatment plan for your needs. No preparation whatsoever is required before your Ultherapy procedure, although we may recommend that comfort measures, such as over-the-counter or prescribed medication, be taken prior to treatment. Comfort levels vary from patient to patient and can depend on the area treated as well. Dr. Horn will discuss options for making the experience as pleasant as possible. The sensation you experience is associated with the focused ultrasound energy as it is deposited below the surface of the skin. It is noticeable just while the energy is being delivered and patients typically leave comfortable and excited about the benefits to come. You are able to return to your normal activities right away, and there are no special measures you need to take. Your skin may appear flushed immediately after the ultrasound treatment, but any redness should disappear within a few hours. It is not uncommon to experience slight swelling for a few days, or tingling/tenderness to the touch for a few weeks following the procedure, but these are mild and temporary in nature. There is the possibility for other less common post-procedural effects, such as temporary small areas of bruising or numbness, and other rare effects which Dr. Horn will review with you. 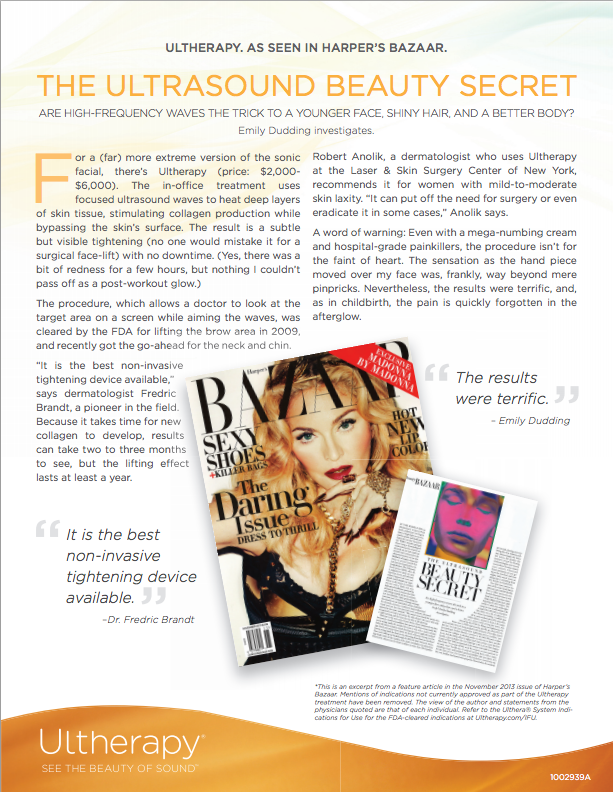 Laura Brown, Executive Editor of Harper’s Bazaar, promoting Ultherapy treatment as the one “must do” treatment to stop your neck and face from falling! If any questions arise, please contact Dr. Corinne Horn or her office to discuss your questions or to make an appointment.